We all share notions of invulnerability. We think we can go on forever being strong and vital. "It can't happen here," we say until something does happen. That commonest of all views is the most mistaken. Though our bodies differ in size, physique, and inherent strength, they have in common a predictable group of physical attributes. These features are well known but become particularly important in regard to health issues and work-connected stresses. What I share here comes from hard-won practical experience, and from observation, reading, listening to fellow craftspersons, and consultation with doctors and physical therapists. No one will dispute the human body is marvelously designed. Essentially our bodies are supported by skeletons and with a central structure called the spine. Additionally, we are tied together by a network of elastic members called muscles, tendons, and ligaments that in turn are controlled by an intricate organization of signal devices called nerves. I wish to call attention to the vital interplay between the spine and the nerves running parallel to it, because when these intricate parts break down, we begin to malfunction. The resultant exquisite pain we experience is called sciatica. Just what are the stresses on the back? The ideal position for the lumbar spine is lying flat on your back; that puts only 25 pounds of force on the disks. Lying on your side raises this to 75 pounds, while standing generates 100 pounds of force. If you lean forward a bit, the force increases to 150 pounds, and simply holding a 10-pound weight in that position makes the stress jump to 220 pounds, nine times greater than lying flat on your back. Imagine what happens when you lift a 50-pound bag of clay incorrectly, with the spine in a rounded (flexed) position. In that case, there is 10 x 50, or 500 pounds of force or more on the lumbar spine. What about the usual seated position at the potter's wheel? That generates a minimum of 185 pounds of stress on the back, hour in and hour out. Leaning to the right to view our work adds more stress. Coupled with these strains, applying work pressures to the clay through our arms adds even more. To cap it off, we often, unthinkingly, lift the finished pot while leaning forward from a seated position. I recall vividly the terrible, aching back I lived with for years, all the while not really questioning what was going on. The truth is we work at a profession equal in stress and strain to heavy industrial labor, but we are poorly informed and are not trained to deal with the inevitable stress or damage to our bodies. A complete turnabout on these health issues is long overdue in schools. How many of us were taught specifically about proper lifting techniques, or about spine stress, or about the meaning of pain and the dangers it signals? My guess is that most of us learn as I did, by going from pain to crisis and then seeking remedial help. When I mention these matters in workshops, many people speak out, encouraged perhaps to overcome their embarrassment at having hurt themselves. Fellow potters are injuring themselves at an alarming rate, and my message is that every time you risk damaging yourself through uninformed work habits your future is at stake. Before describing my own disk injury, however, I would like to make a few comments about pain. First, I owe a greater understanding of pain to my potter wife Susie Symons. Her own experience with a sports-related back injury taught her about dealing with pain. Second, the critical lesson is that pain is not normal; pain tells us something is wrong and something should be done about it. For example, my reaction to a growing problem with soreness in my elbow several years ago was to shrug it off as an occupational necessity, a natural by-product of throwing and therefore acceptable. I had to learn the opposite was true, then to seek physical therapy to correct the problem through supportive exercises, which I now do four times weekly at home. “What you have to understand, John, is that disks become injured for a variety of reasons. Don't forget, age alone tends to lessen their resiliency. You have been working for twenty-two years in a seated, flexed, forward position, and the disks in the lumbar area have been under terrific stress.” These words from my trusted physical therapist, Charles Dorando, sum up my journey toward the injury called Classic Ruptured Disk Syndrome. The disks-the cushions between the vertebrae-absorb shock and help us bend and move. Given enough stress they can crack, and the fibrous core material can eject into the surrounding spinal area. The condition known as sciatica is the pain resulting from the pressure of this ejected material on the sciatic nerve which runs down the leg. Trust me when I say it is a form of exquisite pain you should avoid at all costs. It is important to know what to do and what not to do in preserving and promoting spinal health. The things on the not-to list are hidden in work habits, attitudes, and mind sets contributing to injury. For example, do not overwork or ignore pain. I overworked. I love my life as a potter, but I overdid it, often working beyond fatigue and pain. The tendonitis in my left elbow and those years of backaches were obvious signals. I excused such nagging symptoms because of the good results of my life-the good pots, earning a good livelihood, and the happy feelings about being a creative artist. I equated the orderly flow of the day's events with well-being, unaware that pain is connected to health. I adopted a work ethic imagined from potters of other times where productivity per se was the goal. A strange, mixed blessing! Then too there is traditional behavior in the studio. Watch the studio assistant in your ceramics class heroically load the kiln by weight-lifting large heavy shelves onto that last high niche in the top rear of the kiln. We have abused the body through bad habits over the years. The seated throwing position alone accounts for the single most damaging practice of potters. 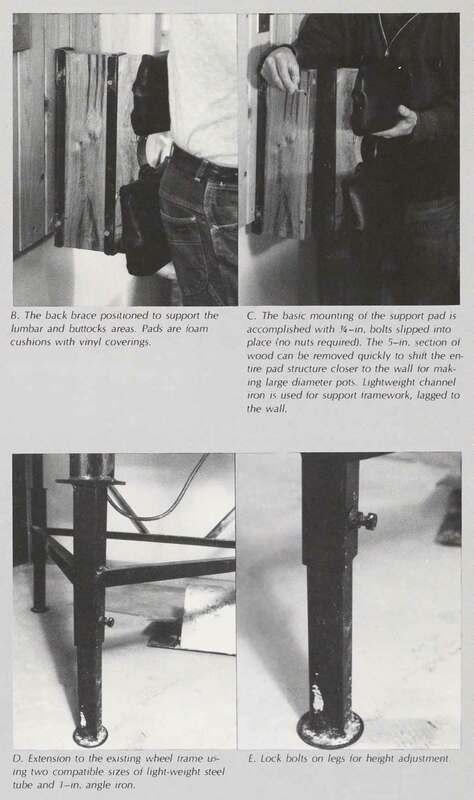 When, in addition, you think of the numbers of flexed spine positions and lifting activities potters subject themselves to, you will, I hope, agree with my definition that our work is industrial labor. Living with sciatica is an utterly draining experience. That severe, electric pain jolting down one or both legs is so bad for some people that they even prefer crawling to walking. At the start of the pain, it is difficult to face the fact that you have a serious back problem. I may well have aggravated that condition by being bull-headed, trying to finish that last bit of studio work, or giving that last workshop, instead of taking an honest look at the truth. But sciatica has a way of reducing life to basic survival in short order. I sought help from my physical therapist who immediately began supportive therapy involving ice packs to temporarily ease nerve/muscle involvement, and then careful explorative massage, test procedures and observation to track the area of involvement accurately. Believe me, I urge you never to try self-evaluation on this subject. The nerve involvement is far too critical, and the possibility of doing harm is too real. I chose to work exclusively through my therapist because he has worked extensively with spinal injuries. He works in rehabilitation therapy in postoperative situations with surgeons. He is, above all, conservative and seeks physical rather than surgical remedies whenever possible. The number four-five disk is between the fourth and fifth lumbar vertebrae and is the one affected by the stresses already mentioned. When the potter is seated at the wheel, the stance causes the disk to bulge backward (posterior bulge) due to the strong forces produced by rounding the back. Side (lateral) forces are applied also because we tend to lean to the right as we throw. Tracking the nerve involved can most often help identify the type of bulge or its deterioration. I was fortunate that CAT scans (sophisticated X ray techniques) confirmed the existence of a directional bulge of the pulpy disk material. The goals of therapy were then designed to support the area of trauma through treatment and exercises. Essentially the program I undertook involved wearing a back brace for three-and-a-half months, seven days a week, to keep the spine in a slightly hyperextended (arched back) position. I slept each night with a lumbar support pad belted to my back, did not sit except for rare instances, knelt or stood at meals, lay belly-down to relax, read, or watch TV, and when absolutely necessary I was driven in a van and almost always flat on my back. During this time the prospect of surgery was examined with a neurosurgeon recommended by my physical therapist, especially when progress toward pain-free living seemed slow. also consulted a number of potters and friends who had gone through the laminectomy (disk operation) procedure. The prospect of being out of the studio for a six-month recuperation period held no appeal, but any hope for relief from pain seemed worth considering. I was fortunate. The supportive physical therapy began to have an effect, and the pain began to leave. I learned that in some cases of disk injury the ejected disk material is retracted away from the sciatic nerve or is reabsorbed by surrounding tissues. At this writing I am scheduled to have a second CAT scan to further confirm what physical evidence indicates. It is now nine months since the injury became part of my life. I have been pain-free for about four months. I live a more informed, careful life, and work with new awareness and respect for the real issues involved. Above all, I am grateful for the chance to continue to be a potter. If I could give a lasting gift to all potters, it would not be a wonderful glaze formula or new tool. Instead I would give the gift of awareness about the wise use of our bodies. In the discussion that follows, I outline the rethinking processes I went through, and the technical solutions that I now employ in my studio. All are aimed at making productive and vigorous work possible while being far safer. Fair warning, however. Old, comfortable, even if painful, habits die hard. The seated throwing position requires immediate attention in the search for better spinal care. By looking at historical precedents, talking with fellow potters, and on advice from my therapist I chose the stand up approach. I began my trials by piling up bricks under the legs of my Soldner wheel to discover a good working height. I determined the wheel head should be level with my navel. If set any lower, I was forced to bend from the waist to get a proper attack for throwing, which would have duplicated the flexion stresses that were the problem in the first place. I now rely on my elbows tucked into my rib cage instead of resting my elbows on my thighs during throwing as before. The accompanyir:ig photographs show an extension framework under the wheel frame. I use a combination of 1-inch-angle iron and lightweight, square, mild steel tube of two compatible sizes. The slip fit of the tubes allows for an adjustable height option. Large 5/1&-inch nuts are welded to the outer tube and a sturdy, short bolt passes through the outer tube and clamps against the inner tube (leg). Naturally, I thought of the variety of wheel heights that might be considered for different throwing situations, especially tall pots. The adjustable leg option is one useful idea. Also a sim pie, sturdy, foldaway, wood platform will serve well when extra height is needed. At navel height I have no trouble throwing pots 16 to 18 inches high, and that suits almost all my needs. The mobility of the Soldner foot controller allows perfect access and positioning in the standing throwing posture. A simple nudge slides the foot pedal from side to side as needed to rest your legs. An antifatigue mat lessens leg strain. Off the wheel, I also ride a stationary bike regularly to promote good muscle tone, and have no leg fatigue whatsoever. Equally important is the use of a back support. Daily use of lumbar support pillows in chairs or while driving clearly taught me their benefits. This is just as true for someone who has not sustained disk damage. I started by measuring the height of my own lumbar region, and made a few prototype support pads. You will note in the photographs the support comes in two places: the upper for the lumbar area and the lower for the buttocks. The lower is vital in providing balanced support, allowing one to take a slight weight off the supporting leg (one leg is on the controller). The lower pad is not a seat per se. I lean back slightly as work proceeds and the forces associated with throwing gently and comfortably promote good contact with the two pads. The pads are simply wood frames with 4-inch seat foam padding held in position by vinyl fabric stapled to the rear frame. After throwing intermittently throughout the day I have high energy and no backache. To accommodate larger diameter wares, I built a removable section or spacer in my mounting bracket, held together with Y.-inch bolts which readily slip out. It is easy to step off to one side when larger diameter pots are made, and I am away from the support pads only momentarily so back strain is not a question. It is essential to remember that the back support will prevent your lumbar spine from rounding and thereby placing the bulging backward thrust on the disks. 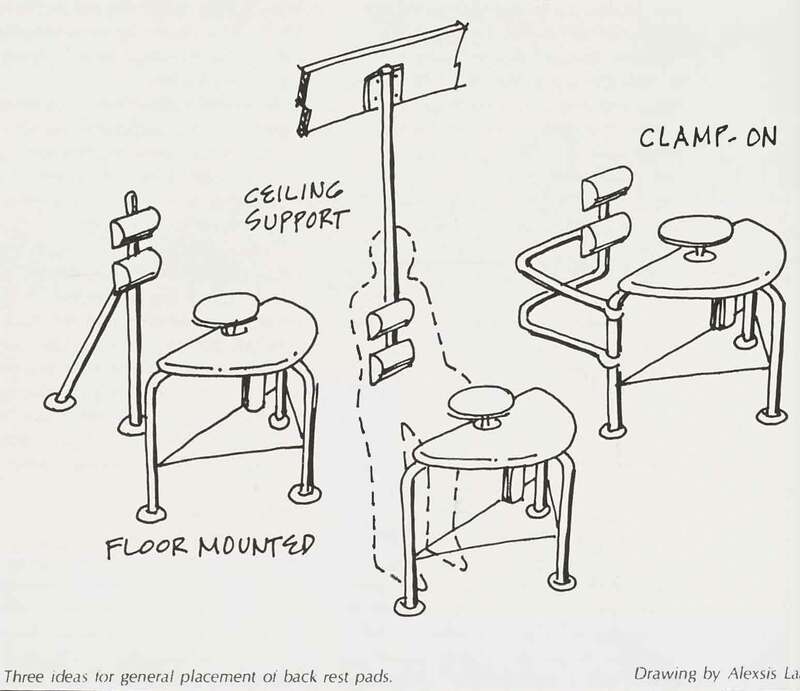 An alternative to the wall mount idea is anchoring the support pads from the floor, ceiling, or wheel frame itself. Bending from the waist to grab a bag of clay and lifting it using the lower back is not the correct or safe way to lift. A 185-pound person puts up to 1,000 pounds of pressure on the lumbar spine while lifting a 70-pound weight. The bowed-out back position stretches muscles and ligaments often to the point of damage. Proper lifting involves squatting to lower yourself to the level of the load with the lower spine bowed in and thrust forward. While keeping the weight close to your body, raise your head to begin to lift, then raise up with your legs. During the lift, if you have to turn, use your feet and legs, not your trunk. Never bend from the waist to deliver the load back to the floor. Improper lifting is a major contributor to back strain and injury. Prompted in part by my injury, I built my first car kiln in 1986. The advantages are clear. 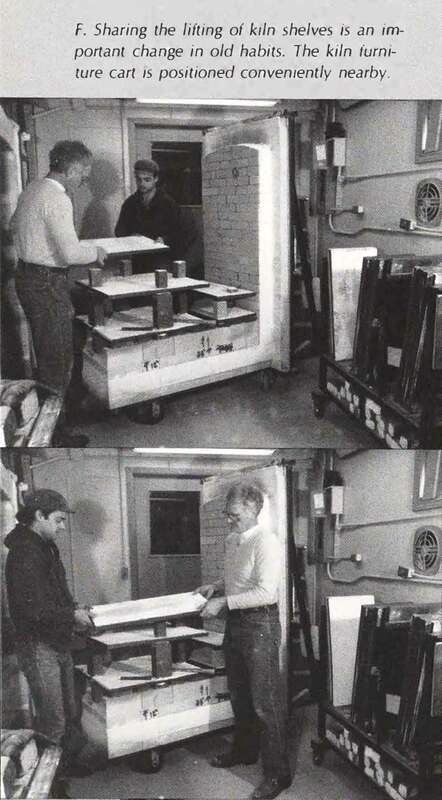 The car body comes out of the kiln into the room where easy loading close to the chassis is possible. Two people can share in lifting the kiln shelves. I have designed a wheeled kiln furniture cart that drives up close to the kiln's car and allows shelves to be easily grasped from waist-high storage. One future bright spot is the advent of lighter weight refractories for kiln shelves. The one that offers increased strength and lower weight due to a thinner cross section is a product called nitride-bonded silicon carbide. A typical shelf 12 x 24 inch size is only 1/2 to 5/8 inch thick. Shelves of this size weigh approximately 15 to 18 pounds, compared to 18 to 22 pounds for the 1-inch thick older silicon carbide types. The thinner shelf saves approximately 40 percent in space use in the kiln load. Nitride-bonded kiln shelves are more expensive than silicon carbide shelves, but the savings in weight and volume offset this. 1. Educate yourself about proper attitudes and habits in work. 2. Switch to throwing while standing up. Evidence in its favor is overwhelming. 3. Rework existing bench or table heights to allow work while in a fully erect posture. 4. If seated while at work use only high quality, properly designed chairs with excellent lumbar support backrests. Consider the Balans type of posture-oriented chairs in this respect. 5. Give up heroic, endless sessions of any one type of work. Throwing for eight hours a day is sheer madness. Break the day into multiple tasks of standing, sitting, light work, heavy work. Simple exercises done during the working day will prevent tension, fatigue, and stress. 6. Get professional help for devising exercise programs geared specifically to your individual needs. When you get one, use it. 7. Examine all aspects of your daily routine with fresh eyes. Your goal is a longer working life through good health. John Glick (1938 - 2017), earned his MFA from Cranbrook Academy of Art in 1962, then operated Plum Tree Pottery in Farmington Hills, Michigan, from 1964 through 2016. There he mentored numerous young artists through his assistantship program. Among his accolades are two Louis Comfort Tiffany awards, and two National Endowment for the Arts Fellowships. He was a prolific writer, and his work appears in numerous books on ceramics.